There are times when misplaced attention or lack of focus are not the problem. The problem is too much focus, an excess of attention. Take unsuccessfully debugging software or getting stuck writing a short story or looking for a misplaced bottle opener. Often getting stuck in these cases is too much attention - lodged in the wrong place. If you can - quickly break your attention with something that will eventually bore you. For example I get a kick out of looking at the Ulysses Hapaxes but it's not really the type of thing you read from cover to cover in a single sitting. However if you are stuck on a coding error that is not where you are looking for it, take it out and find a word of interest. Highlighting is optional. Ideally you would take a minute to two to look for words of interest. Eventually you lose interest and get back to programming. With any luck your attention has been drawn away from it's stuck pattern but hasn't had time to wander away. This is the problem with, say using the web to break attention. You can't figure out what the problem is with your pointer allocation so you look for something online and end up half an hour latter bookmarking some site for the latest programming tips. But now your attention is so broken that short term memory is struggling to get back on task. The key is the attention breaker shouldn't have distraction potential and it would be nice if it used a different part of brain for a couple minutes. 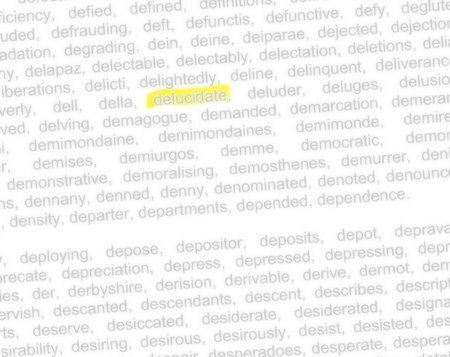 As for delucidate - what a great word. Yes there is an Italian verb conjugation with this spelling but this looks like a Joyce neologism. What is the opposite of elucidate? Not darken. But delucidate. It's not quite obfuscate but more taking something that is understood or known and making it less comprehensible or providing contradictory analysis.